Do 48 volt appliances exist? I dislike inverters. I really dislike inverters. When I use them, i want it to be for luxuries or entertainment. I'd like to run all my refrigeration, pumps, fans and lights on DC. So far I found a 48 volt sunstar, a 48 volt sundanzer and lights with a wide dc voltage range are cheap and easy to find. Yes I know it costs more but I just don't like the idea of everything I have running off A single finicky electronic device. Know of any more? Not a lot that I have seen. Battery voltage can vary quite a bit, from 42 to 60+ volts... One of the advantages I liked with AC inverters is that they stabilized the 120 VAC and you did not the blinking/variable lighting/operation of equipment. Also, DC current is will "sustain" arcs much better than AC. So DC switches/breakers/fuses/etc. have to be a lot more "heavy duty" than their AC cousins. And, the advantage of sending less current at higher voltage (120 VAC nominal vs 48 VDC nominal) saves in copper wiring costs too. Finally, it is much easier to "isolate" power source from load. Transformers, Ground Fault Interrupters, etc. can make for a safer electrical environment too. Otherwise, if you are happier with the 48 VDC appliances--Would be interesting to hear what more about what you find and how it all works out for you. Not a lot for 48v, but you'll find quite a variety of marine/rv stuff in 12v or a smaller number in 24v. a few days ago at the North American Auto Show the head of FCA was talking about the need for vehicles to use a 48v system. Once that happens we may see more 48 v appliances. My problem with inverters is they add a huge electrical load to your daily needs. Lets say I have a 2000 watt inverter. A high end inverter at 48 volts reaches around 95% efficiency which sounds great, except thats at peak. Its more like 70-80% on the low end, such as a refrigerator running. They always rate them at peak efficiency and thats 75%+ its rated capacity which you will rarely use in an off grid set up. They also have self draw, just being on your looking at 15-20 watts for a typical 2000 watt inverter. You can go smaller if you just want to run a fridge but you still need to factor that in to how much power it needs. So that efficient 320 KW a year fridge now uses an extra 300-500 watts just to run a fridge. thats 180 kw roughly a year so now its a 500 kw a year fridge. Not very efficient at all. Downside is no large 19 cubic foot fridges exist beyond sunfrost, especially no non freezer units. I have a sundanzer and I love it. its a 12/24 unit though. I dont think I would part with dc appliances. I like the redundancy it adds to a home. Lighting is easy at any voltage now, you can get standard 60 watt equivalent LED dc bulbs with a voltage range from 10-90 volts dc so pretty much universal. I think i will stick to 24 volts. 48 volts may be cheaper in the long run but its to restrictive and reliant on inverters. I'd rather have my freezer/fridge, lights, fans and pumps run off dc and use the inverter for stuff thats not viable or for convenience items. Converters are just another finicky electrical device that can break, I also dont know how well they will handle motor surge. Actual efficiency charts are hard to find. If i had a proper hydro set up I would go 48 volts though and just keep a spare inverter. At that point efficiency is irrelevant. 500 watts 24/7 365, with even a modest 500-1000 watt array would be more than enough power for an entire modern home. Yes inverters are a mixed blessing slash necessary evil. I turn ours off at night, which not only saves the overnight tare on the inverter but also kills all the standby / phantom loads as well. It also turns off some stuff i dont happen to need/want at night like wifi and cordless phone.... and kills the RF from the wifi while we are sleeping... and the ULF from the inverter as well. All with one stone ... awesome. Years ago, when tv stopped at midnite, there used to be this cute animation of a guy putting the milk bottles out, the cat out etc. Its like that last one to bed kills the inverter switch in the kitchen. But... the inverter in aux off still uses some watts. But... maybe increases thermal cycling on teh electronics. But... now my (awesome but) tired DC fridge, the door seals are not that flash any more. Not looking forward to the bill for a new one. Also need a deep freeze. They occasionally come up on the second hand market, but new im looking at at least 3K for the pair. OTOH... maybe some of that cost is offset by longer battery life. Could go to two inverters, one smaller one for the fridge and freezer, (get inverter fridges), and use the same strategy as above.... maybe. 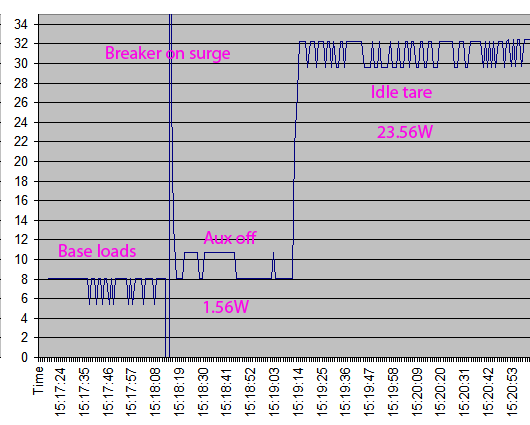 BTW people commonly under estimate the idle tare of a 3kW inverter. You sometimes see guys on the midnite forum, whose batterys wont come up to SG, and they dont seem that interested in us telling him they dont have enough solar. The inverter was using most of his production. BTW Outback list the idle tare of the VFX as 20W. I figure that they measured it on 120V, because it seems to use more on 240V. I clocked it at 26W. I think i paid 1600 for my 15 cubic foot sundanzer including freight. Keeps stuff rock solid cold, especially when fully loaded. I want another. One for meat, the other for veggies and packed foods. I just wish someone made a 12/24 upright that was just a fridge with no freezer. Like a 10 cubic foot fridge with upright freezer like insulation. Actually i just measured it a little more scientically (WBJr plot). 23.56W, and 1.56W in Aux disable mode.